I like interviews with musicians and songwriters (and visual artists) because they often get talking about the creative process in ways that writers usually don’t. I’m not sure why that is. Maybe they’re just more forthcoming? Or maybe they’re less intellectual about it? Whatever it is, there’s a short interview with Gabriel at the website where he gets talking about the recording process, and when I was reading it I instantly thought of the composition process for poetry (of course I did). I like Gabriel’s two camp model (below), as, of course, it’s always a complicated interplay . . . and people are always decamping and switching camps. But I like it nonetheless, as a way to think of oneself or others, to understand how you or others work ("Are you an A or a Zed?" what a nice AWP pick-up line!). And so how do you feel about diversions when you’re in the process of composing a poem? Are they a distraction? Or a gift from Spicer’s Martian Radio? Guitar Center: Some of your songs are densely layered. Do you have all of those pieces in mind before you record or do they reveal themselves as the process unfolds? Do you prefer to record tracks live with a group of musicians or individually on a track-by-track basis? 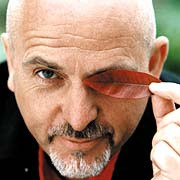 Peter Gabriel: I think there are two forms of creative energy. One is "energy A," which is an analytical energy where you layer things up track by track, then zoom in and work on little details. The other is "energy Zed," which is a Zen-like performance energy that is spontaneous and improvised and produces a different animal. Both are useful and important. The smart process involves harvesting performances then analyzing them and layering them up. Initially you might just look at rhythm, then maybe you look at melody, then harmony, then timbre. Each time you put down a layer of performance you slow it down and analyze it. Musicians need to be aware of how they work. Sometimes you just need to flip it and do it the other way and see what happens. Working backwards is an exploratory process. I love diversions and I keep on following them, which makes the process a lot longer. If you haven't already, check out Brian Eno's book "A Year with Swollen Appendices"--basically, it's his diary from 1995. I read it years ago, not sure if Gabriel is mentioned (can't remember if Eno & Gabriel worked together in '95, but, of course they have before). It's an interesting glimpse into the creative processes of Eno (& others). I wonder how much Eno has influenced Gabriel & vice-versa. The Future Is Being Written. Are You Part of it?